If indie-rock sweethearts, the Raveonettes, were hoping to jettison the media-bestowed tag as “the Danish White Stripes,” they don’t appear to doing a very good job. During the band’s Tuesday night concert at Minneapolis’ First Avenue, the male-female two-piece of Sharin Foo and Sune Rose played with two supporting acts closely affiliated with their Detroit contemporaries. To be fair, the appearance on the bill of Michigan’s Ko & the Knockouts (which records for the White Stripes’ erstwhile label, Sympathy for the Recording Industry) and British neo-blues singer Holly Golightly (who starred as Jack White’s guest duet partner on the Stripes’ last release) could have been cutely arranged by the concert’s promoter hoping to play up the comparison to boost attendance for the Danish group’s first Minnesota appearance. It perhaps was also the powers-that-be’s fault for the fact that the Raveonettes only took the stage five minutes before midnight — and this on a school night — to a medium-sized crowd up of both the curious and loyal fans. When the Raveonettes finally did start playing, the duo, supported by an extra guitarist and drummer, plowed through 21 songs of noisy rock at ear-bleeding volumes. At the show’s end, they made it clear that while the band might share similarities with others in the garage-rock scene, their music is a unique — and loud — amalgam. This is most apparent in the group’s use of feedback. On their new album, “Chain Gang of Love,” the guitar squeals and howls that’s such an essential part of their songs, can be enjoyed from a safe distance (imagine songs that fuse the delicate beauty of the Velvet Underground’s first album with the eardrum-shattering volume of their second). It is well mixed in relation to the other instruments and comes across as an additional coloring to a song’s melody. On the stage, however, it came at full roar and frequently bowled over the vocal harmonizing between Foo and Rose. While sometimes thrilling — songs like “Let’s Rave On,” “Little Animals” and “The Love Gang” were delivered with fuzzed-out guitars and thundering bass so powerful that the soundwaves could make the skin on your limbs shudder — it got repetative on occassion. It sometimes seemed they were more interested in making the feedback then playing. Beneath these musical explorations, one could glimpse the musical influences that underpin their music and brought the band to this point. The group’s love of New Wave appeared in songs like “That Great Love Sound,” which has a clang-y intro that’s similar to the main melody of the Clash’s cover of “I Fought The Law,” and “Heatbreak Stroll” which has a “My Sharona”-type beat and fidgetting guitar pattern. 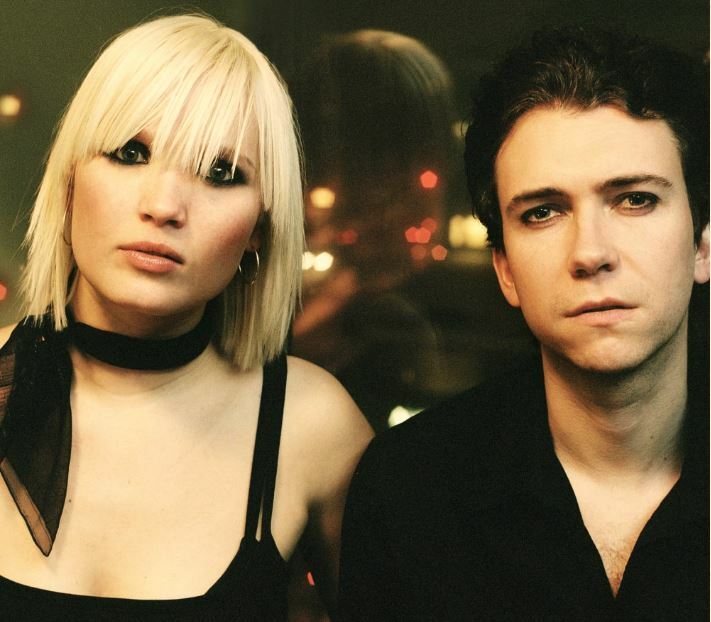 Like the White Stripes, much of the Raveonettes’ music draws from American roots music. But unlike the Stripes, even when the Raveonettes invoke these influences, the songs and sound are delivered through layers of feedback and shrieking, guitar dissonance. Even a surprise cover of rockabilly hero Eddie Cochran’s “Come On Everybody” was drenched in snarling, white noise. Oddily, this gave it a facelift that made it something new. Another unexpected aspect was the group’s onstage chemistry. Although the blonde-haired Foo looks the part of the Nico-like chauteuse, it was her partner Rose who was more reserved onstage. While she smile and spoke frequently with the audience, he seemed to relish trading Jeff Beck impersonations — turning his back to the crowd and flaying his guitar near the amplifier to create sculptures of feedback — with his fellow guitar player. (During “Noisy Summer,” Rose dove to the floor to produce a surge of growling feedback.) The only time he really tried to engage the crowd was to thank them near the show’s close. When it came time for an encore, the audience seemed too dazed by the relentless volume bombardment to cheer. Although obviously pleased enough by what they heard to linger near the stage and wait for the band to return, any clapping was minimum. The band swiftly returned for three more songs — including a frenzied version of “Cops On Our Trail” from their debut EP — and continued to pummel the faithful with waves of sound. Although it was a long wait for the Danish pair’s appearance, it wasn’t fruitless. Ko & the Knockouts warmed up a sparse crowd bitten by autumn’s chill with some pop-punk that alternated between being lumbering and lilting. Equally impressive was Stellastarr, an East Coast New Wave band that will continue to open for the Raveonettes for the remainder of their U.S. tour. Reminiscent of the New York outfit, Interpol, Stellastarr’s gloomy music was catchy mixture of tight rhythms and Edge-like guitar dissonance. It was luckily a combination that went a long to way to overcoming the bellowing voice of their singer Shawn Christensen and his rock star posturing. Tags: First Avenue, Holly Golightly, Ko & the Knockouts, Minneapolis, Minnesota, review, Stellastarr, the Raveonettes, Twin CIties. Bookmark the permalink.